Not guilty one bit ! Someone needs a thunder shirt bad ! Love the face! Hey Moby, humans may not know that metal like that can often radiate some “electrical” qualities during thunderstorms and some dogs can feel & hear it. I know, you are just protecting your humans. Good dog! 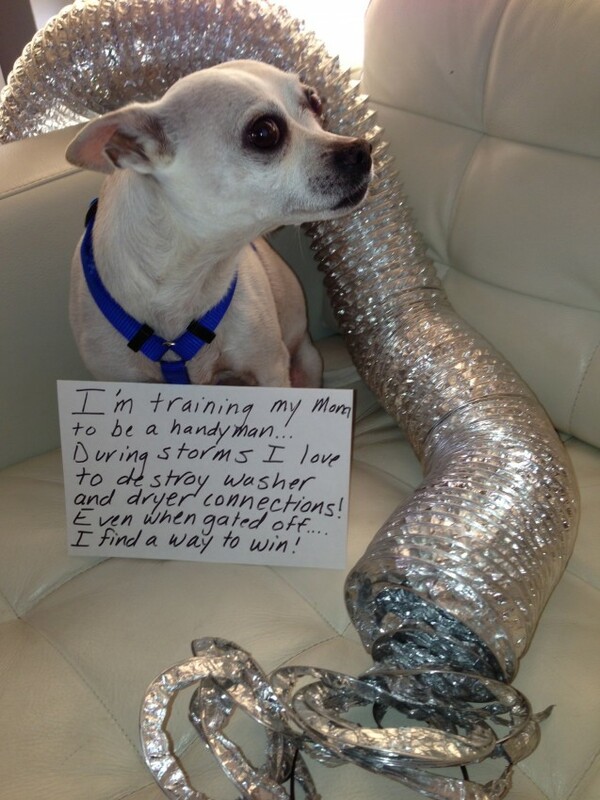 Dogs afraid of thunderstorms will try to hide behind/in something metallic, like plumbing pipes or aluminum dryer vents in your Moby’s case. Best investment I ever made for my thunder-phobic dog was a Storm Defender Cape. Google it, and you’ll find all sorts of information on how it works.